I finally upgraded my phone last night, and I could not be more thrilled. I went with the white and gold iPhone 5s. I’m usually more of a silver than a gold girl, but the gold is so pretty – it’s more champagne than brass. Though I hated to cover that pretty back up, I knew I’d hate it more if I dropped it and ruined it, so in a case it went. I went for the exact case above. I like that it feels durable for protection but is still slim (I don’t like bulky cases). I also bought this egg amplifier from J.Crew a couple of weeks back, and it’s such a great, little sound amplifier that’s ultra portable and gives decent sound without worrying about batteries or wires (perfect for the bathroom vanity). It’s quite affordable ($12) and would make a great stocking stuffer. 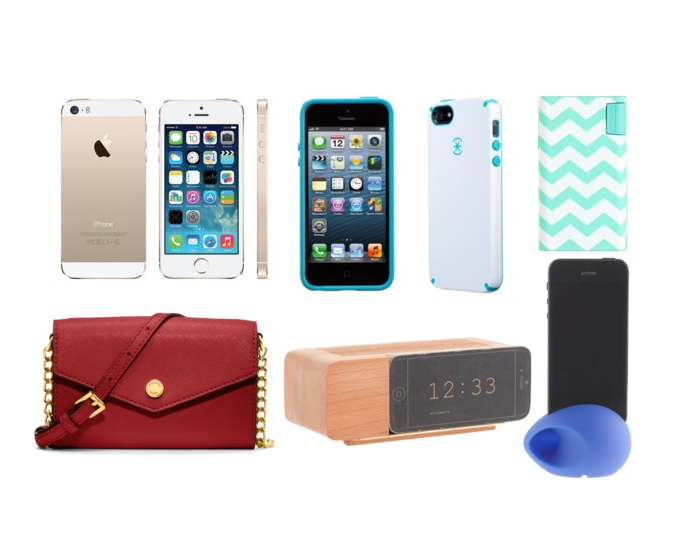 I’m all set on the phone front, but if you’re still thinking of gifts for a (i)phone lover on your list, this phone crossbody with detachable strap, this universal charger, or this Don Draper-worthy dock would be good ones.